BBC NEWS | Business | Are cheap tickets becoming pies in the skies? Are cheap tickets becoming pies in the skies? A couple of years ago, to my shame, I flew from London to the northern Spanish town of Santander. For lunch. Indulgent? Definitely. Environmentally irresponsible? Almost certainly. But some friends suggested it, and I went along, purely because the plane ticket - including taxes - cost considerably less than my first bottle of San Miguel. And though I can see the arguments against my last minute jaunt, rarely can chorizo have been scoffed with such smugness. Judging from the queues on the 6.30am flight from Stansted, we were not the only ones who had made the 1p-each way purchase on impulse in the same way as you might an ice cream. 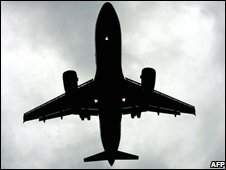 Some five million British passengers have used the so-called no frills airlines - such as Ryanair and Easyjet - which made flying within Europe an affordable option for the first time. There may have been no free food or drink, and the battle for seats could be a bit unseemly, but was fair game for a cheap ticket. But as the price of oil, and consequently jet fuel, soars, many analysts are predicting that the days of the cheap flight is coming to an end - that the budget airline model no longer works. Though not, it seems, quite yet. When Ryanair pledged on Monday to cut average fares by 5%, offering "plenty of bargains" for its customers, there were a few raised eyebrows - not least because earlier this year it told investors that average fares would in fact rise by about 5% in the year to March 2009. The fare fall was "a negative surprise", according to Neil Glynn, an airline analyst at Dublin based stockbrokers NCB, given the announcement came at the same time Ryanair warned it may lose 60m euros (£47m) in the same period. Howard Wheeldon, senior strategist at BGC Partners is a touch more forthright. "For a start management needs to climb off the high and mighty pedestal and accept that nothing short of at least a doubling of ticket prices will suffice," he says. "Instead of talking this crisis down as an opportunity for Ryanair to gain as more and more smaller airlines go bust, it must accept that as long as the price of oil remains at anywhere near the current levels that absolutely no one will gain." Ryanair's chief executive Michael O'Leary disagrees. Increasingly price-sensitive customers will be the winners he says, while the losers will be some of his rivals. "Higher oil prices won't end low fare air travel. We will continue to absorb them, even if it means short-term losses," Mr O'Leary says. Instead he predicts that more expensive carriers in Europe - which tend to include a fuel surcharge in the price of their tickets - will either collapse or be forced to consolidate. Airline consultant John Strickland agrees that carriers may fail. "The airlines that are left will then come along and pick up the bits that they can make profitable," he says. And for the consumer, this will mean fewer options when choosing a flight, which, market forces suggest, will enable the low-cost carriers to increase their fares, especially when economic conditions improve. Easyjet says it will cut the number of flights over winter and Ryanair is taking about 20 planes out of service (Mr Wheeldon suggests that it should keep up to 60 jets in the hangars "for as long as the crisis demands"). Recent falls in oil prices - from highs of $147 to closer to $130 - have been "comforting for airlines," says NCB's Mr Glynn. But he adds that high fuel prices need to be passed on to passengers eventually. For now, though, with its key markets being the UK, Ireland and Spain - all of which are seeing tough economic conditions - the fare cut move may be needed to "stimulate demand and steal market share", he says. "This is not the end of budget airlines but the ramifications are that we will see lower levels of capacity going forward should the oil price remain at these levels or rise further." Mr Strickland agrees that budget airlines will not disappear but predicts that customers may end up with less choice. "That's already happening as carriers cut the number of routes they offer or reduce how regularly they fly between certain places. "So if you have a holiday home in the South of France for example, you might find, especially in the quieter months, that you can't fly there on the days you want, or even at all." 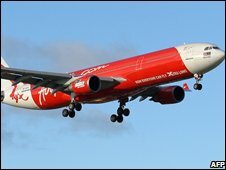 Despite undeniable difficulties, the budget airlines are seemingly better placed than their more expensive rivals. Flight information firm OAG says that low-cost carriers globally have seen 13% growth in passengers this month compared with July 2007. Meanwhile scheduled flights worldwide have seen growth of just 1%. And the airlines are keen to find any way they can to eke a few extra quid out of those passengers. Despite warning of massive losses, Ryanair says that income from ancillary items - luggage charges, credit card booking fees and priority seating and those remiss enough not to print their own boarding cards - are rising. The airline's chief financial officer, Howard Miller, says these are all optional for the customer and could be avoided - for example by bringing only hand luggage or paying with a Visa Electron card. But Mr Strickland said that, in practice, this does not often happen. "Most people will have to check in a bag or use a credit card," he says. "The airlines know that."